Look at the puzzle on the right. We'll use this to illustrate some of the solving strategies that there are for killer sudoku. The first strategy you will want to apply is to look for sum regions where there is only one combination, and to write that in straight away in the cells as the options. For instance, look at the '6' composed of three cells in row seven (in yellow). What three numbers can sum to 6, bearing in mind you can't repeat a combination? The answer is of course 1,2,3 - and so you can write these in the row. So, the most straightforward rule is to look at the cages and find those that have only one combination, or at least very few, and use that to reduce the options. Another rule that you will use a lot - and much more than you do in sudoku - is that to do with the sets. For instance, we just placed 1,2,3 in those three cells in row 7. This means that no other cell in row seven can contain any of 1,2,3. One of the most interesting rules that comes into killer sudoku is called the rule of 45. This tells you that the total sum of the numbers in each row, column and 3x3 box is 45. That is calculated quite simply as the sum of 1+2+3+4+5+6+7+8+9 and results from the fact that each region (there are 27 regions in a 9x9 killer sudoku) must contain each of these numbers once. Trickier puzzles often require you to use the rule of 45 to make progress, and whilst it comes intuitively to some, it is not always obvious to spot or understand how it can be used to help solve the puzzle. Therefore let's look at an example of the rule of 45 to understand how to use it. Look at box six - the middle right box in the puzzle. You will see that there are four sum regions that contain cells in that box, and three of the four sums contain ALL their cells in the 3x3 box. This means that we know the sum total of the '17','17' and '8' regions fully contained in the box region is 42, and since all those cells are in the 3x3 box, this means that the one cell left (the purple cell at the bottom left of the 3x3 box we are looking at) must contain a 3, because this is 45 - 3 and we have already allocated '42' as the sum total of the other eight cells in the 3x3 box region. Using this rule and spotting where it can be used is the key to solving some killer sudokus, but also makes solving other puzzles that don't necessarily require it a lot quicker. 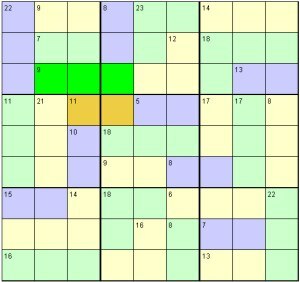 Many solvers therefore scan the puzzle at the start for easy to place values like the '3' just used in the example above. See if you can find other examples of where the 45 rule can be applied in this puzzle to instantly place a value in a cell.